This generative poem re-purposes the code in “Tokyo Garage” and produces a remix of “Taroko Gorge” that is also an inversion of the natural world. As the poem unfolds like an endless stream of Toy Story outtakes (in which toys gain a life of their own when away from the children that own them), but with other older toys, many of which are no longer in circulation. Words like “toxic” remind us of some of the reasons these toys were recalled or discontinued. 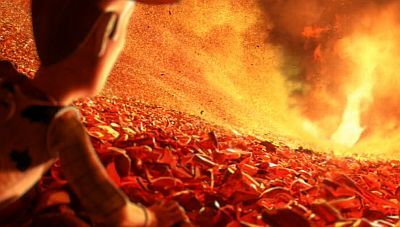 The poem also reminds us of how much waste is generated by the toy industry, as does the climactic scene in Toy Story 3 (image below). This reminder of the products created by the toy industry, the use and eventual destruction of toys by children, and the resulting garbage from this process, is emphasized by the use of capitalized letters, the Comic Sans font, and exclamation marks. Memmott’s acknowledgement of preceding writers of Taroko Gorge poems by listing their names (crossed out, as established and echoed by Rettberg and Carpenter, respectively) cemented a budding tradition of tracing influence in new remixes using this method. This isn’t code for mere consumption, for hoarding in a garage, or to be discarded after reading. It is designed to be used, reused, recycled, remixed.